Here in our little nook of the world, waterfront living is desired above all. That comes as no surprise considering the tranquil, secluded nature that waterfront property provides. In addition to the picture-perfect views, simply observing nature - specifically water - has been shown in scientific studies to have cognitive benefits. Simply observing water, or ‘blue space’ as it’s often called, has been linked to “higher perceived restorativeness” than those studied without exposure to water. Supporting this notion, directly observing the water has been linked to a whole host of positive effects: calmness, clarity, creativity, relaxation, restoration, healing, peacefulness, negative ions, and general happiness, just to name a few. Simply put, being in the presence of water has positive effects on the mind and the body. As an architect, my goal is always to maximize the benefits of the home and property by marrying the two in a way that enhances the landscape and is tailored to my client’s desires. Modern Architecture has always been my passion for many reasons - design, simplicity, intentionality, creativity, innovation - but what tends to separate Modern Architecture from more traditional design is the unique ability to merge spaces: To blend the indoors with the outdoors. 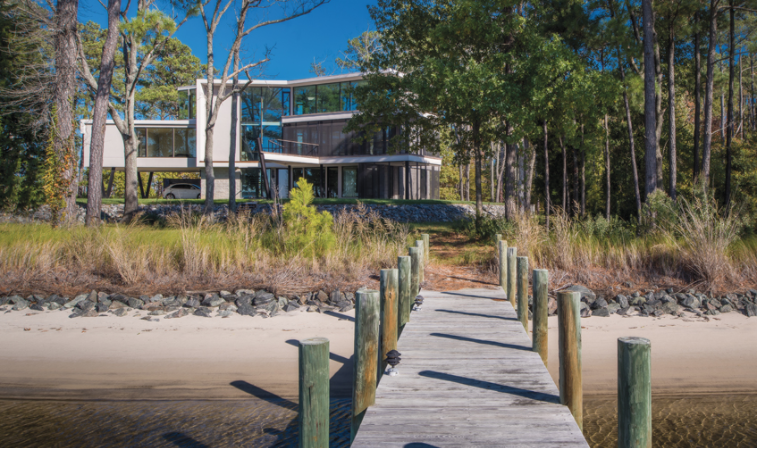 Waterfront homes are extra special. They give us an opportunity to tap into the benefits of “blue space” from inside the home while we’re sleeping, eating, reading, exercising, and so on. When we draw the water in, we are creating an unlimited flow of scientifically proven, positive benefits on the human body every single day. Windows, windows, windows. Particularly on the waterfront side of the home, floor-to-ceiling windows help create the illusion of a merged space. With fewer areas of wall space and maximum window coverage, you’ll have the sense of being outside. High ceilings. Low ceilings tend to give a feeling of constriction and block the feeling of expansion. Raising the height of the ceilings, even if only in the main living space, gives an open and flowing feeling to the home. Acknowledging entirety. Maximizing the views and blurring the lines between indoors and outdoors isn’t just about the land or the home. It’s about creating a custom atmosphere by turning a waterfront lot into a personalized, intentional home. This can be attained through a comprehensive, cohesive design that considers both the architecture and the landscape, both existing and proposed. The structure and the landscaping should be one, not separate. For example: thoughtful design and placement of plants, trees, pools, patios, porches, piers, and other outdoor structures. Our friends over at The House & Home Magazine published this in the August/September 2018 edition. View the article here. Sure enough, the couple returned five years later, ready to start the process. Both endure a hectic daily commute from New Jersey to Manhattan, where the wife works as a tax attorney and the husband as a day trader. They were looking for a refuge from the chaos—a re- treat for holidays and weekends and, ultimately, for retirement. They wanted contemporary style and water views galore. Kipp began by walking the property—no easy feat, since “it was so overgrown we literally had to have it cleared before we could get to the water,” he recalls. Once there, however, views capturing peace- ful, scenic Little Bay at the point where it opens into the Chesapeake made the trek worth the trouble. Kipp sited the house with this panorama in mind. “There are views in both directions,” he notes, “and the beauty is that they are never static; they are different in each direction. We wanted to get both views.” He therefore designed a structure that angles at its cen- ter to accentuate vistas to the north and south. The 4,000-square-foot building is elevated above sea level by a four-foot-high plinth that protects it from flooding and lends it pres- ence when approached from the water. As further insurance, the lower level is clad in heavily rusticated concrete that resembles stone. “I figured in any severe weather event the building was certain to get scuffed up and I wanted to provide a material that could take the abuse,” the architect explains. Polished-concrete floors on the lower- level interiors were a practical choice in case of flooding. Builder Joe Heyman of The Allen Group was tasked with making Kipp’s complex design a reality. He and his team framed the building out of steel to ensure that it could withstand hurricane-force winds and accommodate massive, heavy expanses of glass. “We used two-story window systems with frameless glass corners that are supported by steel beams and bar joists,” Heyman says. “They are all triple-pane windows from the German company Unilux, with hurricane-rated glass.” Challenges included installing a floor-to-ceiling, lift-and-slide door that spans 24 feet; it joins with a glass pocket door at one corner without employing any visible framework. The house is composed of two volumes separated by a three-story atrium. At its center, an elevator shaft is wrapped by a cantilevered, three-story steel staircase. Glass bridges connect the volumes on the second and third levels, creating a line of sight down to the first floor and “a delicate, treehouse effect,” says Kipp. One volume contains the public spaces: an open living/dining room, kitchen, powder room and screened porch on the second level and a home office and a hearth room with a fireplace and TV on the third. The other volume houses the master suite on the second floor and a solarium on the third. Guest rooms, rec room, kitchenette, laundry and mudroom occupy the lower level, which leads out to a spacious carport below the master-bedroom wing. The emphasis throughout is on light and views. Openings in the floors and ceilings connect each level, with balconies on the second and third levels overlooking the floors below and glass walls adding to the sense of openness. Part of the second floor’s airy, open-plan living area spans two stories, while floor-to-ceiling windows bring the outdoors in. The lift-and-slide wall of glass stacks to one side, extending the living space seamlessly out to the adjacent screened porch. 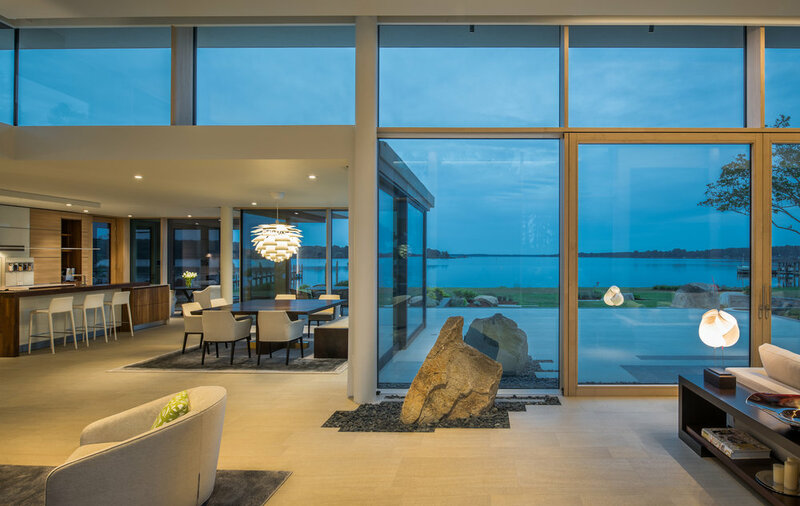 The solarium, a contemplative space, features a corner wall of floor-to-ceiling glass with vistas of Little Bay on one side and the Chesapeake on the other. Kipp embraced what he calls “a marriage of modern and industrial” for the minimalist interiors. He left the steel columns exposed, painting them bronze. Custom railings of powder-coated bronze steel and ipe, designed by the architect and fabricated by local metal worker Jeffrey Darden, maintain openness inside and out. Rift-cut oak clads the floors on the second and third levels, and the windows are set deep into alderwood frames. The kitchen and master bath are sleek and modern, with custom alderwood cabinetry and quartz countertops. Architecture: Randall J. Kipp, AIA, NCARB, Randall Kipp Architecture, Irvington, Virginia. 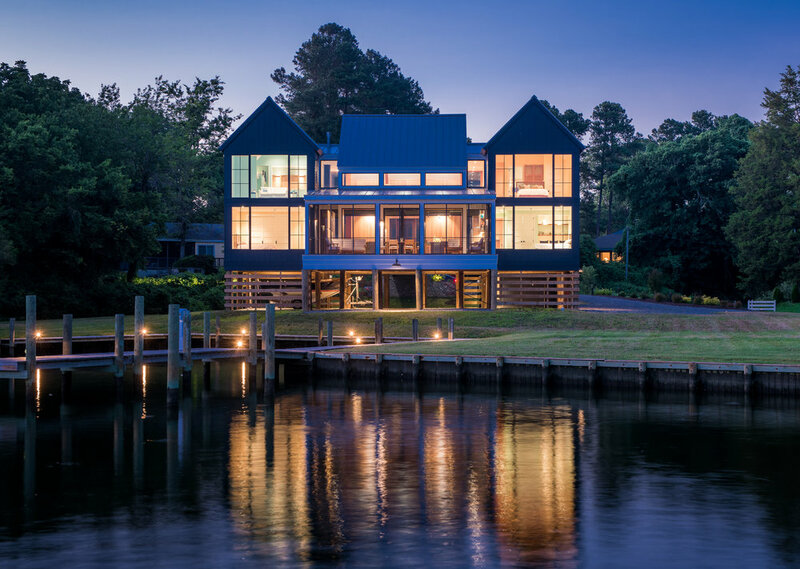 Builder: Joe Heyman, The Allen Group, Inc., Urbanna, Virginia. Thanks to our friends at the Rappahannock Record for sharing the news of this honor! View the press release here. © 2019 Randall J. Kipp Architecture, Inc.